This second scenario is for a more complex project involving higher print runs for a larger audience. 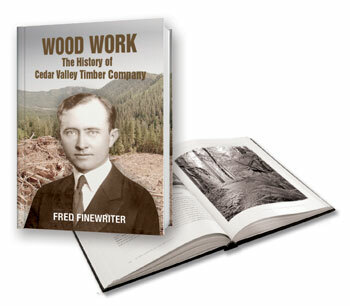 This narrative centers around a logging company owner who played a part in advancing logging techniques. Controversy surrounding industry innovations provides for some interesting firsthand accounts. The company’s impact on the growth of the local town also play a key part in the story. The town's current population is down from its heyday but holds steady at about 8,000. This book chronicles three distinct aspects: the personal history of the owner, the controversy around the labor-saving innovations, and the innovations themselves. These aspects broaden your range of buyers. Abundant documentation as well as historical photos will also provide added interest. Since the town still exists, additional sales could come from gift and tourist sales. 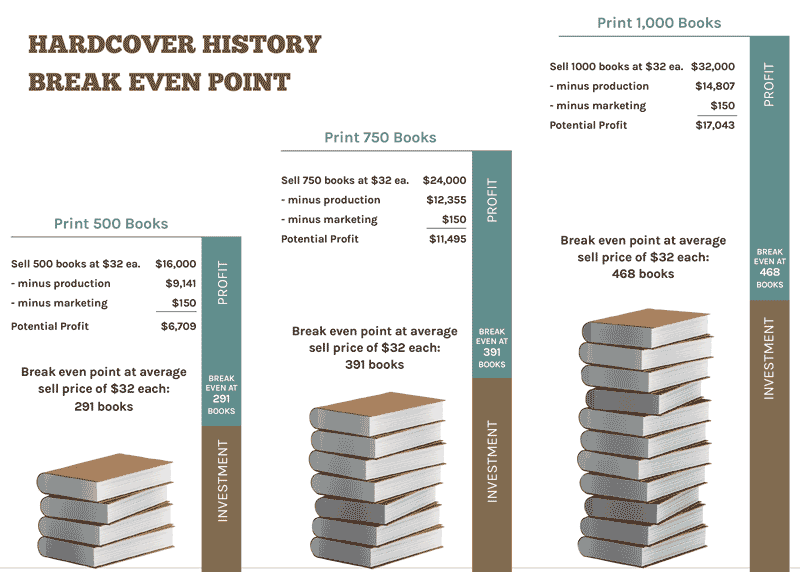 In this scenario, selling 500 to 1,000 books may be feasible. We think this book would justify a printed-and-laminated hardcover treatment. Though more expensive than softcover, the added credibility and permanence of a hardcover will work in your favor to ask for a higher cover price. With great photos and documentation and tight, quality editing, we would estimate 224 pages. Combined with professional design, this book should command a $35 to $45 cover price. Keep within a standard trim size like 8.5 x 11"
Scenario Two strategy is similar to Scenario One strategy. With a cover price of $40, wholesaling to the museums at 40% discount would be $24. If you sell half the books to a museum at $24 and the other half through your web page at full cover price of $40, you would have an average selling price of $32. The graph illustrates the investment, break-even point, and potential profit based on three different quantities. As you can see in this scenario, the stakes are a little higher, but so are the potential returns. With careful pinpointing of your selling avenues, as well as diligence and tenacity in your marketing efforts, this project could be very viable. You might want to consider a somewhat conservative approach on the number of books you print, with the idea that reprints are always possible.